The present work focused on investigating the effect of process parameters on surface roughness and thereby optimizing parameters in turning of OHNS high carbon steel based on Taguchi technique with DNMG carbide insert. Taguchi method stresses the importance of studying the response variation using the signal-to-noise ratio, resulting in minimization of quality characteristic variation due to uncontrollable parameter. The results are analyzed using Analysis of variance (ANOVA) method. Cutting speed, feed, depth of cut were used as the process parameters whereas surface roughness selected as performance characteristic. The L9 orthogonal array based on Taguchi method was used to conduct experiments. It was observed that cutting speed is the most influential process parameters on surface roughness. MLA Doneti Gopi Krishna and Megavath Vijay. "Taguchi Analysis on Surface Roughness in Turning OHNS High Carbon Steel with DNMG Carbide Insert." International Journal for Innovative Research in Science & Technology 4.5 (2017) : 1-7. APA Doneti Gopi Krishna and Megavath Vijay. (2017). Taguchi Analysis on Surface Roughness in Turning OHNS High Carbon Steel with DNMG Carbide Insert. International Journal for Innovative Research in Science & Technology, 4(5), 1-7. Chicago Doneti Gopi Krishna and Megavath Vijay. "Taguchi Analysis on Surface Roughness in Turning OHNS High Carbon Steel with DNMG Carbide Insert." International Journal for Innovative Research in Science & Technology 4, no. 5 (2017) : 1-7. In this paper we have provided the fundamental issue of fully mechanical design and building of economical robots and their controller. Rather than seek an bright general purpose robot â€” the humanoid robot, everywhere in todayâ€™s research as the long term goal â€” we are increasing the information skill that can design and manufacture special-purpose mechanism and controllers to achieve specific short-term objectives. These robots will be constructed from reusable sensors, effectors, and computers held together with materials custom â€œwrittenâ€ by rapid prototyping tackle. By releasing the goal of designing software controllers for presented equipment in favor of the mechanical co-design of software and hardware mutually, we will be replicating the principles used by biology in the creation of complex groups of animals adapted to specific environments. Encoding control software has become as hard as more degrees of autonomy and task goals are added to robots, that the most advanced ones do not get past the stage of teleportation or choreographed behavior. In other words, they are puppets, not robots. Our most important suggestion is that the reason current approaches to robotics often fail is because of a dryness of the complexity of the software mean problem. MLA K.Sentamilselvi. "A Study on Co Evolutionary Robotics." International Journal for Innovative Research in Science & Technology 4.5 (2017) : 8-13. APA K.Sentamilselvi. (2017). A Study on Co Evolutionary Robotics. International Journal for Innovative Research in Science & Technology, 4(5), 8-13. Chicago K.Sentamilselvi. "A Study on Co Evolutionary Robotics." International Journal for Innovative Research in Science & Technology 4, no. 5 (2017) : 8-13. Nickel based super alloys have found widespread applications in aerospace, nuclear, chemical and petrochemical industries due to their excellent thermo mechanical properties. However, they pose serious challenges to the manufacturing sector due to their difficult to cut nature causing metallurgical damages to the work piece due to the very high cutting forces which leads to work hardening, surface tearing and distortion in final machined components. INCONEL Alloy 625 is a nickel-based super alloy that possesses high strength properties and resistance to elevated temperatures. The present work is focused on investigating the effect of process parameters on machinability performance characteristics and there by optimization of the turning INCONEL Alloy 625 of based on Taguchi-based Grey relational method. The cutting speed, feed and depth of cut were used as the process parameters whereas the cutting force, surface roughness was selected as performance characteristics. DEFORM 3D has been used to simulate the machining of INCONEL 625 to predict the cutting forces. The experimental and simulation results are compared. MLA Doneti Gopi Krishna, Megavath Vijay, Kosaraju Satyanarayana and N. Sateesh. "Experimental and Finite Element Simulation in Turning Inconel 625 with CNMG Carbide Insert." International Journal for Innovative Research in Science & Technology 4.5 (2017) : 14-23. APA Doneti Gopi Krishna, Megavath Vijay, Kosaraju Satyanarayana and N. Sateesh. (2017). Experimental and Finite Element Simulation in Turning Inconel 625 with CNMG Carbide Insert. International Journal for Innovative Research in Science & Technology, 4(5), 14-23. Chicago Doneti Gopi Krishna, Megavath Vijay, Kosaraju Satyanarayana and N. Sateesh. "Experimental and Finite Element Simulation in Turning Inconel 625 with CNMG Carbide Insert." International Journal for Innovative Research in Science & Technology 4, no. 5 (2017) : 14-23. In this paper, a control technique with low bandwidth transmission correspondences for paralleled three-phase inverters is proposed to accomplish palatable voltage unbalance compensation. The proposed control calculation principally comprises of voltage/current impedance loop controllers, a droop controller, a particular virtual impedance loop, and an unbalance compensator. The inward circle controllers depend on the stationary reference frame to better alleviate the voltage mutilation under nonlinear loads. Droop control and particular virtual impedance loop accomplish exact current-sharing when supplying both linear and nonlinear loads. In addition, by altering voltage references concurring to the adequacy of the negative sequence voltage, the unbalance component, which is for the most part created by single phase generators/loads, can be alleviated to an extreme low value. At last, an AC microgrid which incorporates three-phase three-leg inverters was tried to accept the proposed control technique. MLA G Naresh and K. V Sateesh Babu. "An Unbalanced Voltage Compensation Strategy for Islanded Microgrids by using Fuzzy Logic Controller." International Journal for Innovative Research in Science & Technology 4.5 (2017) : 24-41. APA G Naresh and K. V Sateesh Babu. (2017). An Unbalanced Voltage Compensation Strategy for Islanded Microgrids by using Fuzzy Logic Controller. International Journal for Innovative Research in Science & Technology, 4(5), 24-41. Chicago G Naresh and K. V Sateesh Babu. "An Unbalanced Voltage Compensation Strategy for Islanded Microgrids by using Fuzzy Logic Controller." International Journal for Innovative Research in Science & Technology 4, no. 5 (2017) : 24-41. The world is changing, and this is the digital era. Almost everything around us is digitized and the flow of information is huge from a variety of sources ranging from mobile phone, smart devices, surveillance, sensors of the universe, weather forecasting sensors, medical equipment, customers transactions of the internet, user behaviours on the internet, and so on. Billions of dollars get wasted every year due to fraud. Traditional methods of fraud detection play an important role in minimizing these losses. Increasingly fraudsters have developed a variety of way to elude their detection, both by working together and by leveraging various other means of constructing fake identities. This paper proposed a new approach for fraud prevention in different sector with help of graph database by identifying of previous fraud records in graph database. MLA Deepak Singh Rawat, Rajesh Shyam Singh and Dr. H. L. Mandoria. "Analysis of Fraudulent in Graph Database for Identification and Prevention." International Journal for Innovative Research in Science & Technology 4.5 (2017) : 42-49. APA Deepak Singh Rawat, Rajesh Shyam Singh and Dr. H. L. Mandoria. (2017). Analysis of Fraudulent in Graph Database for Identification and Prevention. International Journal for Innovative Research in Science & Technology, 4(5), 42-49. Chicago Deepak Singh Rawat, Rajesh Shyam Singh and Dr. H. L. Mandoria. "Analysis of Fraudulent in Graph Database for Identification and Prevention." International Journal for Innovative Research in Science & Technology 4, no. 5 (2017) : 42-49. In the present investigation, A356 alloy is used as matrix and Al2O3 is used as reinforcement containing 5, 10 and 15wt% particulates of 40Âµm were successfully synthesized. The synthesis of these composites was carried out by stir casting technique. The connecting rod is fabricated using sand casting. Wear testing was done on samples by using pin on disc equipment, and found the lower wear rates, The experimental results showed significant grain refinement and remarkably improvement in mechanical properties of casting. MLA Santhosh Kumar Sape, P. Srinivasa Rao and T. Naga Raju. "Design and Fabrication of 4-Stroke S.I Engine Connecting Rod of a Two Wheeler using A356 Alloy/Aluminium Oxide (Al2o3)." International Journal for Innovative Research in Science & Technology 4.5 (2017) : 50-55. APA Santhosh Kumar Sape, P. Srinivasa Rao and T. Naga Raju. (2017). Design and Fabrication of 4-Stroke S.I Engine Connecting Rod of a Two Wheeler using A356 Alloy/Aluminium Oxide (Al2o3). 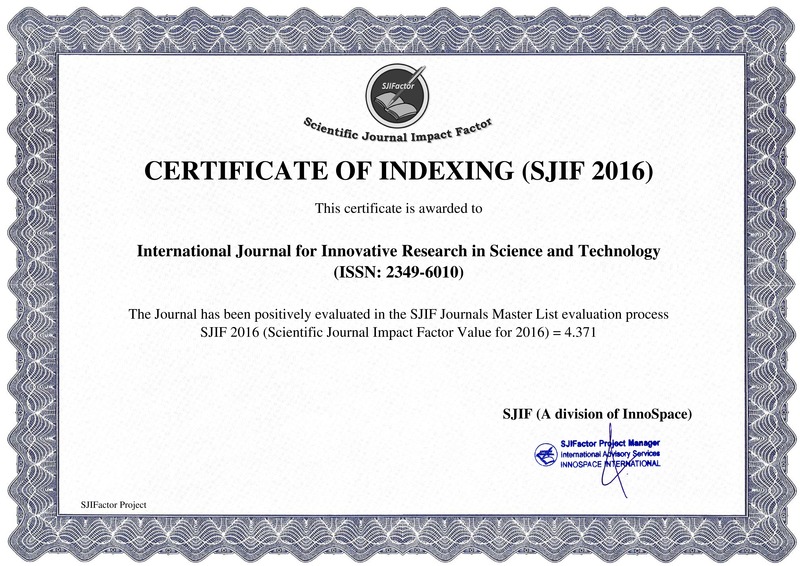 International Journal for Innovative Research in Science & Technology, 4(5), 50-55. Chicago Santhosh Kumar Sape, P. Srinivasa Rao and T. Naga Raju. "Design and Fabrication of 4-Stroke S.I Engine Connecting Rod of a Two Wheeler using A356 Alloy/Aluminium Oxide (Al2o3)." International Journal for Innovative Research in Science & Technology 4, no. 5 (2017) : 50-55. The objective of present study is to utilize the advantages of naturally available fiber material like jute. On unique combination the jute composite material shows improvement in mechanical properties of material. The present review indicate the progress and advantages of jute in combination with resins The Epoxy resins used in industry due to its mechanical properties. It also having lowest cost, easy to process but it possesses some disadvantages like brittleness & hence it is limitedly used. MLA Mr. Mohammadasim Asaphalli Mullani and Dr. D. S. Badkar. "Review on Design and Development of Jute Epoxy Composite Laminate and Investigate Tensile Strength Validate by FEA Software." International Journal for Innovative Research in Science & Technology 4.5 (2017) : 56-58. APA Mr. Mohammadasim Asaphalli Mullani and Dr. D. S. Badkar. (2017). Review on Design and Development of Jute Epoxy Composite Laminate and Investigate Tensile Strength Validate by FEA Software. International Journal for Innovative Research in Science & Technology, 4(5), 56-58. Chicago Mr. Mohammadasim Asaphalli Mullani and Dr. D. S. Badkar. "Review on Design and Development of Jute Epoxy Composite Laminate and Investigate Tensile Strength Validate by FEA Software." International Journal for Innovative Research in Science & Technology 4, no. 5 (2017) : 56-58. The natural fiber-reinforced polymer composite is rapidly growing both in terms of their industrial applications and fundamental research. They are renewable, cheap, and recyclable. These composites material having low density and low cost .moderate mechanical properties hence they are having attention due to easy availability and renewability of raw materials. Natural fibers have been alternative to synthetic fibers and find its applications transportation such as automobiles, railway coaches and aerospace. Other applications include military, building, packaging, consumer products and construction industries for ceiling & partition boards. This Dissertation deals with manufacturing process of Jute epoxy composite laminate with different orientation of fiber and percentage of volume fraction. Aim is Investigate Tensile strength of Jute Epoxy composite laminate. Manufacturing process for Jute epoxy composite laminate with different orientation of fiber and percentage of volume fraction is carried out. Aim is Investigate Tensile strength of Jute Epoxy composite laminate. MLA Mr. Mohammadasim Asaphalli Mullani and Dr. D. S. Badkar. "Design and Development of Jute Epoxy Laminate and Investigate Tensile Strength Validate by FEA Software." International Journal for Innovative Research in Science & Technology 4.5 (2017) : 59-64. APA Mr. Mohammadasim Asaphalli Mullani and Dr. D. S. Badkar. (2017). Design and Development of Jute Epoxy Laminate and Investigate Tensile Strength Validate by FEA Software. International Journal for Innovative Research in Science & Technology, 4(5), 59-64. Chicago Mr. Mohammadasim Asaphalli Mullani and Dr. D. S. Badkar. "Design and Development of Jute Epoxy Laminate and Investigate Tensile Strength Validate by FEA Software." International Journal for Innovative Research in Science & Technology 4, no. 5 (2017) : 59-64. This paper will propose a system which store modeled sensor data instead of storing raw sensor data. In this system we will capture the behavior of sensor data at a particular time period. This reduces the data storage requirement and decreases issues of data redundancy. The proposed system is sensor independent. The user can retrieve the data models for any desired application. This will save the time and human efforts for designing the data models for required applications. It is very much easy to extract the data from these models for the analysis of IoT applications. The input, processing and output operations can be done using the data from the sensor data models. MLA Mahesh A. Mahant, Nihar A. Kulkarni, Sejal A. Mehta, Shama R. Nigewan and Vimukt R.Jain. "Modeled Sensor Database for Internet of Things." International Journal for Innovative Research in Science & Technology 4.5 (2017) : 65-68. APA Mahesh A. Mahant, Nihar A. Kulkarni, Sejal A. Mehta, Shama R. Nigewan and Vimukt R.Jain. (2017). Modeled Sensor Database for Internet of Things. International Journal for Innovative Research in Science & Technology, 4(5), 65-68. Chicago Mahesh A. Mahant, Nihar A. Kulkarni, Sejal A. Mehta, Shama R. Nigewan and Vimukt R.Jain. "Modeled Sensor Database for Internet of Things." International Journal for Innovative Research in Science & Technology 4, no. 5 (2017) : 65-68. The word â€˜voteâ€™ means to choose from a list, to elect. The main aim of voting is to come up with leaders of the people's choice. Most countries are having problems when it comes to voting. Some of the problems involved include ridging votes during election, insecure or inaccessible polling stations, inadequate polling materials and also inexperienced personnel. This online voting system seeks to fix the above issues. It should be noted that with this system in place, users, citizens in this case shall be given ample time during the voting period. They shall also be trained that how to vote online. We will be providing automated online voting system. MLA Mahesh A. Mahant, Snehal Kasture, Namrata Maradkar, Sneha Sherla and Chirag Solanki. "Automated Online Voting System(AOVS)." International Journal for Innovative Research in Science & Technology 4.5 (2017) : 69-72. APA Mahesh A. Mahant, Snehal Kasture, Namrata Maradkar, Sneha Sherla and Chirag Solanki. (2017). Automated Online Voting System(AOVS). International Journal for Innovative Research in Science & Technology, 4(5), 69-72. Chicago Mahesh A. Mahant, Snehal Kasture, Namrata Maradkar, Sneha Sherla and Chirag Solanki. "Automated Online Voting System(AOVS)." International Journal for Innovative Research in Science & Technology 4, no. 5 (2017) : 69-72.